We wouldn't want to argue over a parking space with this scary SUV. There’s been no shortage of modified Mercedes G-Wagons lately. Just recently, Mercedes-AMG unveiled two swanky special editions for the G63 and G65 SUVs, but if they’re still too subtle for you, tuner RevoZport is offering a new upgrade package that makes the squared SUV even more menacing. While the G63 and G65 never exactly looked tame, RevoZport has amped up the aggression considerably. Among its not-so-subtle enhancements are beefy wheel arches that extend the sides by 70 mm. That means this imposing G-Wagon is a whopping 1,995 mm wide, which is nearly as wide as the gigantic G500 4×4 Squared. Wider wheels can be fitted as a result, or you can request RevoZport to provide you with a portal system that allows you to fit the G63 or G65 with wheels from the G500 4×4. Elsewhere, eye-catching carbon fiber vents dominate the hood, and they’re not just for show. The design incorporates a smart ‘water trap’ system to ensure water doesn’t trickle into the engine bay. Other exterior enhancements include a distinctive front splitter with integrated LED daytime running lights, a roof spoiler, carbon mirror caps, and a carbon spare wheel cover. As you’d expect, the interior for the RevoZport G63 and G65 has been covered in copious amounts of carbon fiber too with options catering to your desire. Of course, a brutal body kit needs to be justified with equally brutal power, so RevoZport has made some mechanical adjustments to the V8-powered G63 and V12-powered G65. 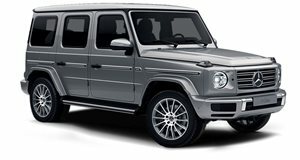 Using an ECU system combined with a lightweight titanium exhaust, power for the G63 has been increased from 580-hp to 650-hp, while the G65 has been boosted from 612-hp to a monstrous 700-hp. We wouldn’t want to argue over a parking space with this scary SUV.